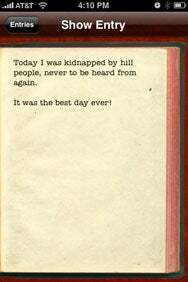 I began my first diary while in grade school, and have kept a paper journal off and on since then. Even in the era of blogs, putting pen to paper can be immensely satisfying and intimate for journal keepers. Diary from Frontier Code aims to recreate the journaling experience for iPhone and iPod touch users, with mixed results. Dear Diary: Diary has a distinct look, with yellowed pages and frayed edges. While Zapfino is the default font, you can switch it to something more legible. Diary is lovely to look at—the design mimics that of a well used journal, with yellowed pages and frayed edges. The default font of Zapfino enhances the romantic feel, though the developers included more legible text options as well. Adding and editing entries is as comfortable as typing on the iPhone can be, and new entries are saved automatically. For those of us who want some additional security for our innermost thoughts, Diary offers passcode protection; you can enter a numerical key, which is certainly a better security option than the cheap “locks” on many real journals. Diary’s interface is elegant and straightforward, but limited compared to the real thing. Diaries often contain much more than words; the ability to add photos to entries would be a welcome feature—Frontier Code says that’s planned as part of a future update. The app took a step in the right direction with a recent update that lets you compose entries in both portrait and landscape mode. While Diary is off to a good start, it needs more flexibility if it hopes to persuade diarists to abandon their pens and journals. Diary is compatible with any iPhone or iPod touch running the iPhone 2.2.1 software update.